As Christmas draws in closely, Steam's Winter Sale has kicked off. This popular annual gaming sale will run until 6pm GMT on 2nd January and there should be at least a few bargains on the way. Microsoft is putting more effort into its software stores and to keep up with the Joneses has begun its own seasonal sale today - the Countdown Sale. Last but not least, in an even more generous offering today I've noticed racing game GRID is free for a limited time, over at the Humble Store. 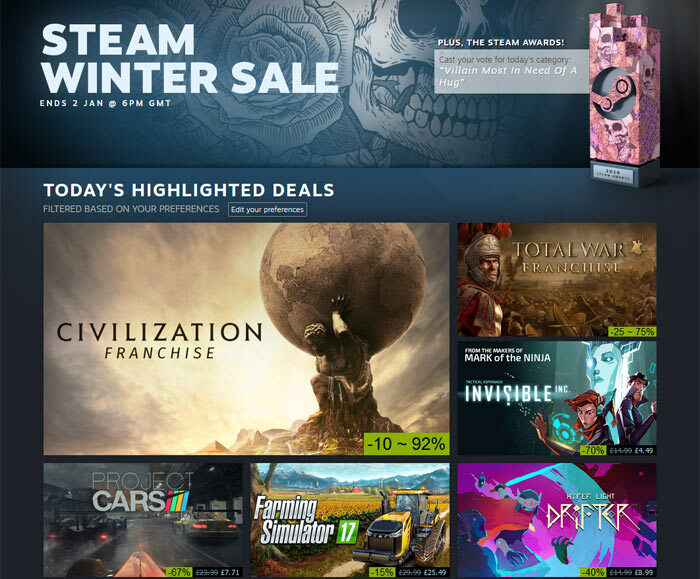 Steam only just held its Autumn Sale about a month ago but has today kicked off its popular annual Winter Sale event. Coinciding with the Autumn Sale Valve opened nominations for the first Steam Awards. Running alongside this Winter Sale is the voting to choose its award winners. You won't be shocked to hear there are some big discounts available on various games franchises. Those catching my eye on the front page include; 25 - 75 per cent off the Total War franchise, up to 75 per cent off the Just Cause franchise, 10 - 92 per cent off the Civilisation franchise, and 40 - 67 per cent off the DOOM franchise. Hardware deals are available too this time around. Valve has various Steam Controller, Steam Link, and respective skin offers. Notably the two main attractions, the Steam Controller and Link hardware themselves are down in price to £27.99 and £15.99 respectively, or bundled together for £39.58. The Steam Winter Sale runs until 2nd January and it's probably worth adding titles of interest to your wish list if you are after a particular bargain, so you get notified regarding price drops. 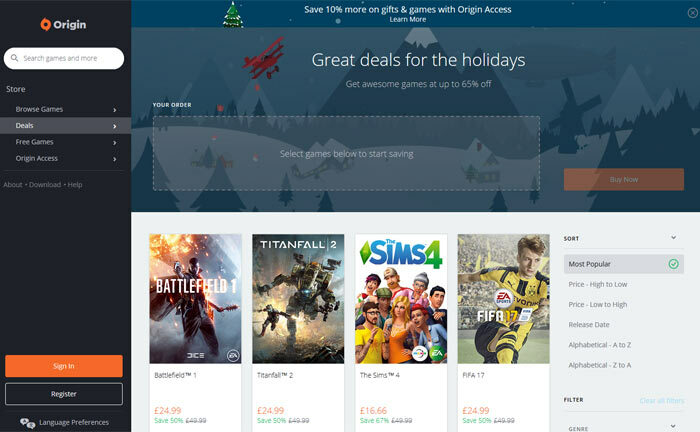 If you head on over to the Microsoft Store you will notice an 'Epic' festive game sale is on. There's not that many games in this sale - only 43 games are listed and more than half of them are free or F2P titles. Nevertheless there are some worthy discounts on Forza, Gears of War, and Call of Duty titles. It's probably bigger and better on the Xbox side of the store. 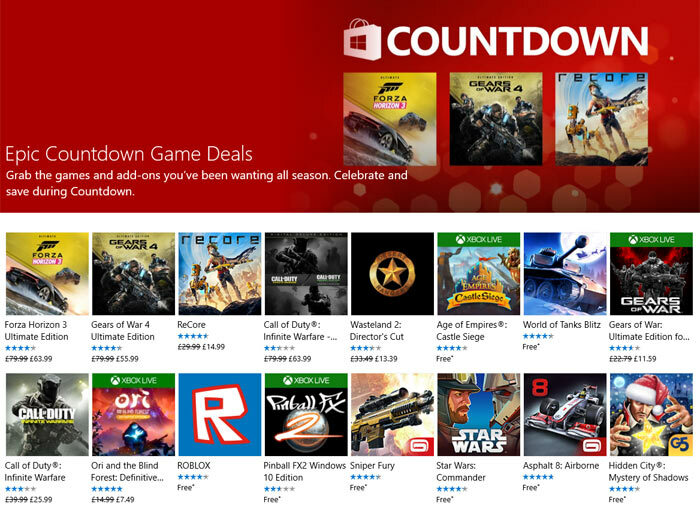 Microsoft's Countdown sale isn't limited to games though. The sale runs right through the Store and you can find discounts on Film, TV and collections of Film and TV series. Music and Apps categories have sales sections too. The best sale deal is, of course, 100 per cent off. For a limited time the Humble Store is giving away GRID, by Codemasters, for free. There is 1 day and 21 hours left for you to grab this offer at the time of writing. Just head on over to the store and log in, click to add it to your basket by pressing 'Get it Free'. In your basket check out and follow the instructions to reveal your game key. It's advisable to redeem your key on Steam more or less straight away, in case you forget. If not "after 10am Pacific on December 31, the code will magically vanish," advises the Humble Store small print. While you are at the Humble Store its worth looking at their sale too - for discounts on games from Codemasters, Mergegames, and more. They call £80 to £64 for a game a discount? Are Microsoft insane? I might get a bunch of indie games and including 8 Bit Armies which looks fun. It reminds me of the good ol' C&C days! The Oculus winter sale is also on, wallet not happy.